Along with the healing stones and wands required for the laying on of stones, I didn’t neglect the beautiful items that enable one to feel wonderful in their soul. Linda Thomas, owner of Eternal Ice Enterprises, is now hosting a 13-week talk radio show on Voice America’s 7th Wave channel. As a Certified Crystal Healer, Linda is an expert in a variety of healing modalities. Each crystal shape, color and internal structure resonates with a frequency that gives each their healing ability. The holistic practice of crystal healing, which Linda calls the “Magik of Crystals”, has been used for centuries as a gentle and non-invasive method of therapy. She will be reviewing these practices throughout the show along with a lively question and answer segment. Other topics include ‘Crystal Healing for Animals’, ‘Aromatherapy’, ‘Supplementing our Physical Healing’ which covers using diet and supplements and ‘Gem Elixirs and Plant Essences’ where Linda will explore how elixirs and essences enhance physical and emotional wellbeing. A brand new website covering these topics was recently completed and now includes an incredible collection of stunning crystals for sale in the Eternal Ice store. “Along with the healing stones and wands required for the laying on of stones, I didn’t neglect the beautiful items that enable one to feel wonderful in their soul. Some of the crystals are quite large and are simply striking as an addition to any home. If you are looking for an amazing crystal ball, I have them in many different sizes and materials. Books, totems, pyramids, tarot cards, runes, pendulums and much more round out the Eternal Ice store”, states Ms. Thomas. The website, developed by Webgrain, now gives Linda’s radio listeners, and everyone interested in holistic healing, access to a variety of dazzling stones and crystals from around the world. Based in Powell Wyoming, Linda teaches crystal healing certification classes for those who would like to learn more. Linda received a certification in crystal healing in 1988 and soon after that completed her first level Reiki certification. She began to teach classes and use her expertise in crystal healing to help others. She has traveled all over the United States doing lectures and classes to awaken people to the fact that they do indeed have choices in their own healing. Recently, Linda qualified for inclusion in the Worldwide Who’s Who Registry of executives, professionals and entrepreneurs for excellence in holistic healing. 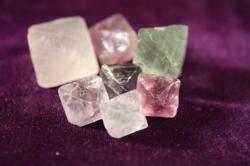 Eternal Ice Enterprises is a healing center that provides crystal healing services and products.